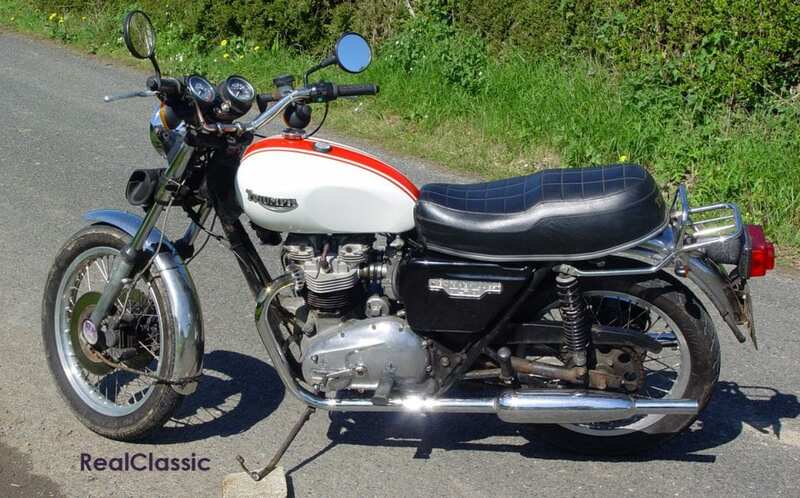 T140 prices are haven’t risen as far nor as fast as for still the more prestigious earlier classics, but private sellers are now asking a minimum of £5k for a well maintained, ready-to-ride example. Dealers ask around £6000 to £8000 for mint machines – and we have seen a couple of exceptional examples break the five-figure barrier. However, cheap n cheerful T140s do still come up for grabs, especially in the less-than-glam UK ‘breadbin’ trim, so it pays to prowl around the small ads. This ripe-for-restoration 1979-model T140 sold for £1725 at Bonhams auction in the autumn of 2016. It was regularly used between 1984 and 1998, clocking up a total of 16,000 miles. Since then, it’s been stored and unused. 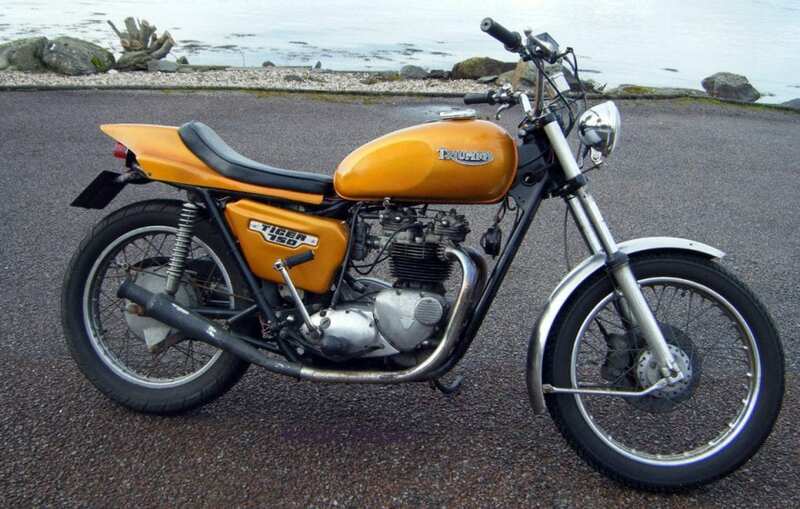 Production of the 750s started in 1973 with the twin-carb T140V Bonneville and the single-carb TR7V Tiger, direct descendants from the Speed Twin of 35 years earlier. 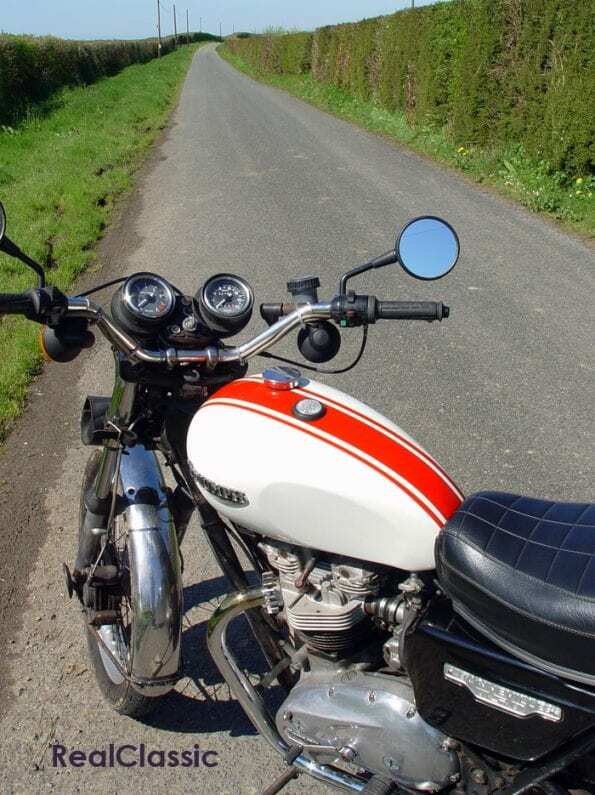 The first few 750s were actually 724cc but the vast majority are 744cc (76 x 82mm) from 1974 onwards. 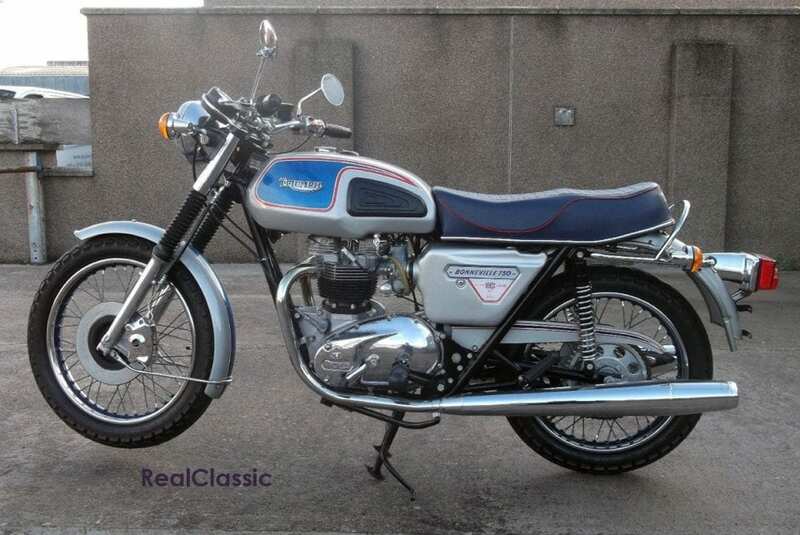 750 Triumphs do everything fairly well although they don’t exactly excel at anything in particular. You’ll find them more nimble through the twisties than their four-cylinder contemporaries, however. The affordable Bonneville looks and sounds like a proper British bike, and feels vaguely familiar to modern bike riders thanks to five gears, indicators, disc front brake, and even an electric start on ES models from 1980. If this is your first Britbike then you’ll find the right-side brake pedal and left-side gear lever arrangement easier to adapt to than the traditional layout – and you’ll be relied to discover the first gear is ‘down’ and all the rest are ‘up’. T140s tend to be somewhat smoother than the preceding 650 twins, with marginally more power and a better spread of torque. The rear brake changed to a disc from a drum in 1976. The suspension boasted ‘race bred forks to give that certainty of handling under all conditions’ with two-way hydraulic damping and a sensible set of gaiters. Actually, the 750s do benefit from sure-footed and predictable steering, so the blurb didn’t exaggerate too much. Claiming that the 10-inch front disc was ‘massive’ was a bit OTT, and few of them feel ‘powerful’ or particularly ‘smooth’ today despite the Lockheed calipers. But there are plenty of available braking upgrades if you wish to improve stopping power. The 1976 TR7 Tiger combined ‘the traditional virtues of thoroughbred handling with a power bonus from the bigger engine. Single carb design provides miserly fuel consumption of up to 75mpg with fuss free reliability.’ Like the T140, it ran at 7.9:1 compression with alloy conrods, plain big end bearings and ball and roller mains; used a multiplate clutch, triplex primary chain, welded oil bearing frame with taper roller head bearings, had a seat height of 31 inches, seven inches of ground clearance and weighed around 415lb dry. 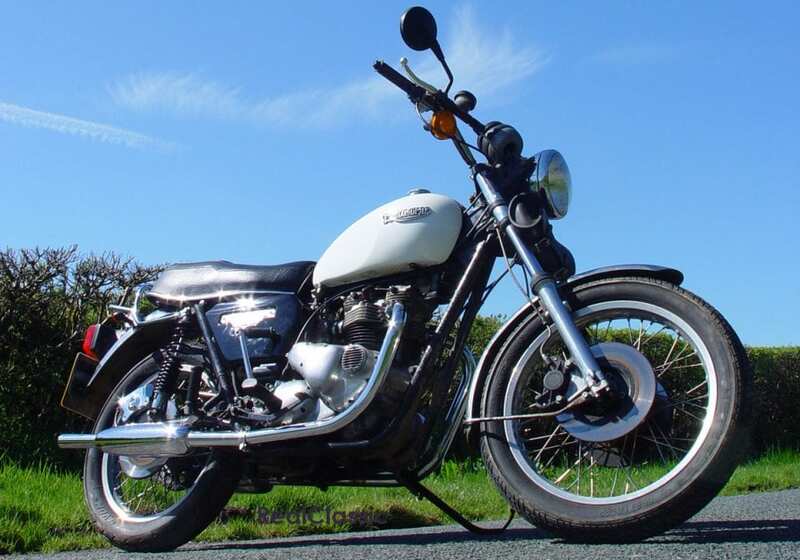 In 1980 the Bonneville was voted ‘Bike of the Year’ by both weekly UK papers and was still selling steadily. The majority of the specification remained unchanged, but weight crept up to 430lb for the electric-start models and there were some tweaks – like moving the rear brake caliper away from road spray to improve its performance in the hissing rain. There’s even an eight-valve version, the TSS (which you should probably avoid unless you enjoy untangling top end traumas), and some attractive special editions like the 1977 Jubilee, various Royals, the luggage-laden Executive, and the extremely handsome and very yellow Tiger Trail of 1981. 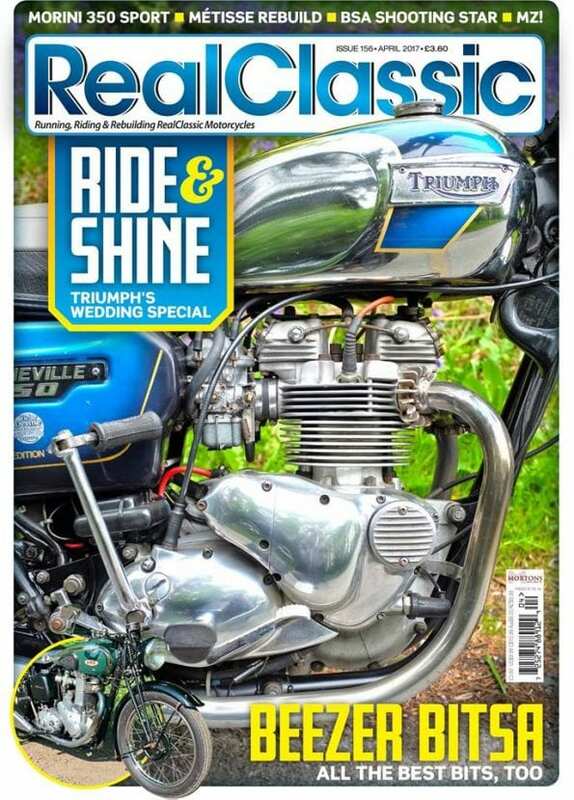 In fact, the Royal Wedding edition appears in the April issue of the magazine. 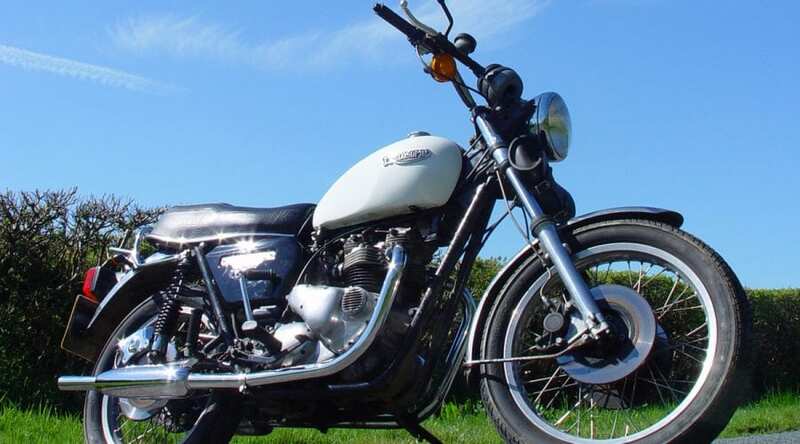 This never-registered dry-stored UK-spec five-speed Silver Jubilee Bonnie has just 12 miles on its clock and was offered for sale recently at £12,000. 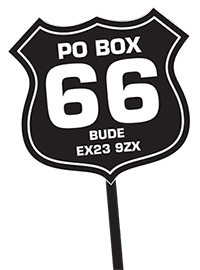 Depending on which model you prefer you’ll get a choice of single or twin discs, cast or spoke wheels, high or low bars, single or twin carb, and so on. American-spec models feature sharper styling than the slab-sided Brit equivalents but the UK bikes benefit from a full-size four-gallon petrol tank: depends whether you want the bike to go a long distance or just look spiffy… UK models had low bars, generating generations of backache, while the US model, with its high bars and peanut tank, revealed why Meriden’s engineers placed the footrests where they did; it all makes sense with the high bars. The final, Devon-built ‘Harris’ Bonnies feature twin Brembos on the Paioli front end but are kickstart only. They also sport Italian rear suspension and silencers and Magura switchgear – altogether a pretty package if you can find one which has had its engine carefully looked after. Spares and expertise are abundant, although not all modern components are of wonderful quality: an established commercial supplier or a well-regarded eBayer may be a better bet than an anonymous autojumble stall. There is a famous saying about repro T140 spares: it can work right or it can fit right, but you can’t have both at the same time… There are straightforward fixes for common faults and an array of useful upgrades, and the bikes themselves are relatively inexpensive yet are capable of clocking up big miles in modern traffic. The TR7 is easier to live with than the T140, unless you’re a dab hand at balancing carbs. All are very happy at 60mph, can sustain 80mph without too much trouble and will break the ton if you ask nicely. 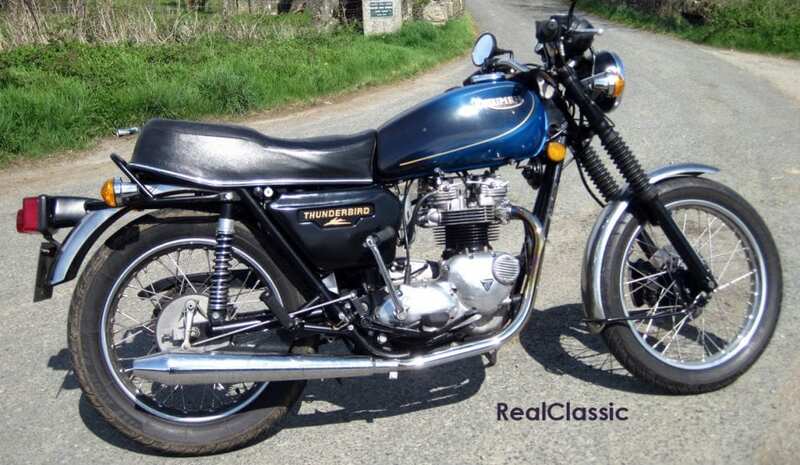 The final incarnation of the 750 was actually a 650: the T140 chopped down to 650 size in the shape of the single carb TR65 which was built for two years from 1981. Less than 500 were made which is a shame, because this is one of the sweetest Tritwins of all time.